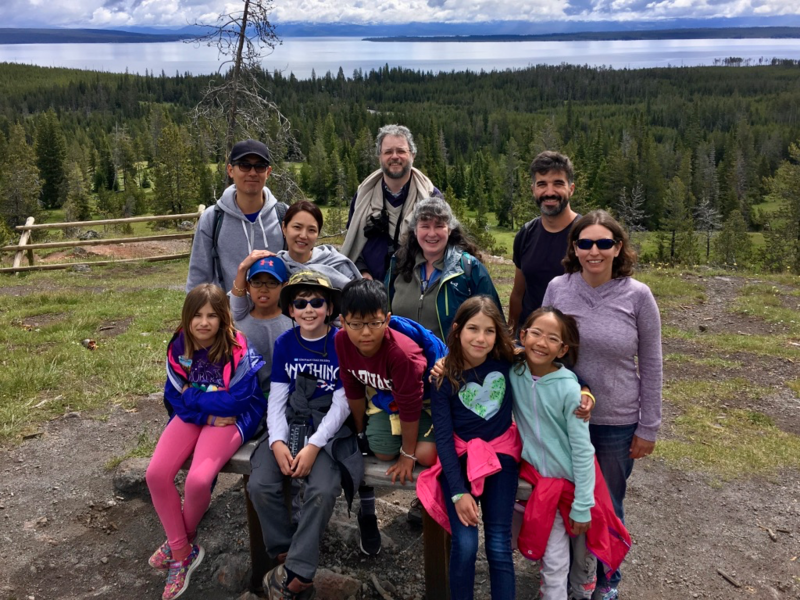 From June 26 – July 1, 2018, our family went on Yellowstone Forever’s Yellowstone for Families: Mammoth to Grant Village tour. Yellowstone Forever is the non-profit organization supporting Yellowstone National Park (YNP). Our tour started and ended at Mammoth Hotel & Cabins, however, you can also choose a slightly different tour replacing a stay at Grant Village Lodge with one at Old Faithful Snow Lodge. This small group tour is for families with children between the ages of 8-12. 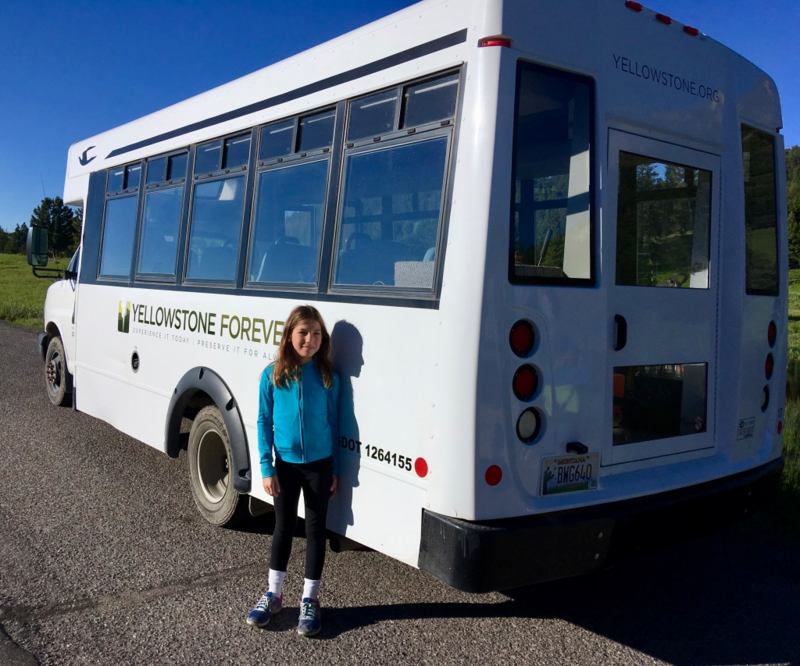 Amy beside the Yellowstone Forever bus we took. 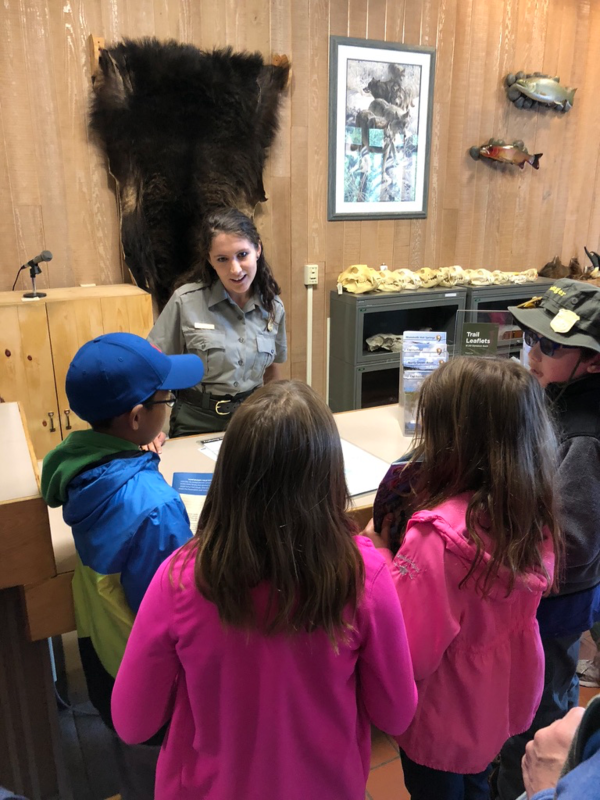 We decided to go with a package tour because it included a naturalist as our guide, a digital camera for the kids to use, the Junior Ranger program, and a watercolor painting activity for the kids. I knew our chances of seeing wildlife would be higher with a naturalist. We’d also get to meet other families with kids of similar ages. 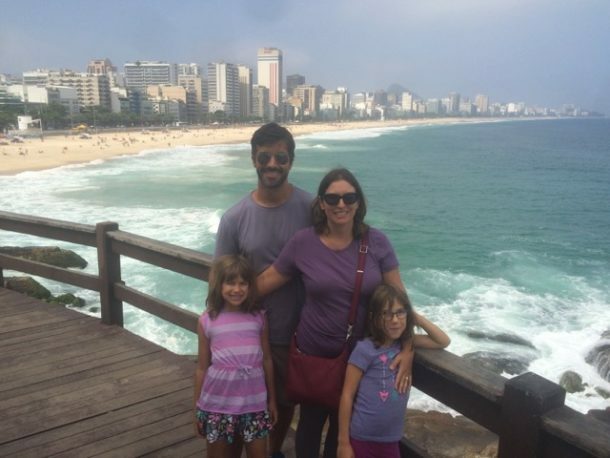 Our group had three families, including ours. One family was from Brooklyn, New York, and the other was from South Korea, but had recently relocated to the Boston area. Of the six kids on the tour, three were boys, and three were girls, which worked out well. We decided to road trip from California to Yellowstone National Park. We took our time getting there, stopping in Nevada and Idaho along the way. Check-in wasn’t until 4:30, so we spent a couple of hours at the Grizzly & Wolf Discovery Center in West Yellowstone, Montana before heading into the Park. I highly recommend visiting the Center if you have the chance. From there, it was about 1 1/2 hour drive to Mammoth Hotel & Cabins. We stayed in a cabin next to the other two families on the tour. There was a grassy area in front of the cabins with lots of ground squirrels. The kids had a lot of fun playing there. Behind the cabins was a hill where we spotted a few elk the first night! There were also a lot of elk on the lawn next to the hotel. That night we met our naturalist guide and the other two families on the tour. We went over the itinerary, and the kids received their cameras and Junior Ranger books. The adults also got a Junior Ranger book, because you’re never too old to be a Junior Ranger 🙂 Everyone also received a 1L Nalgene water bottle to help cut down on plastic water bottles. Our first full day was dedicating to wildlife viewing. I was hoping to see a bear, as I had never seen one in the wild before. We also wanted to see bison, the animal that Yellowstone is famous for. Our naturalist brought several telescopes and binoculars for us to use so we could see the animals up close while staying at a safe distance away. We practiced using the telescopes and binoculars to see birds and ducks at Floating Island Lake. 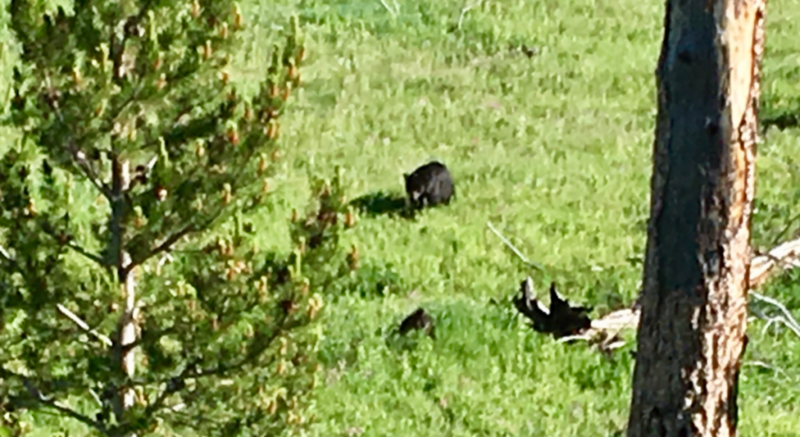 Ten minutes later, my wish came true, when we came across two black bears in a small meadow! One was a cinnamon color and the other was black. We watched them for awhile before heading off in search of our next animal. Our first black bear of the day. It wasn’t long before we came upon a large meadow full of bison. 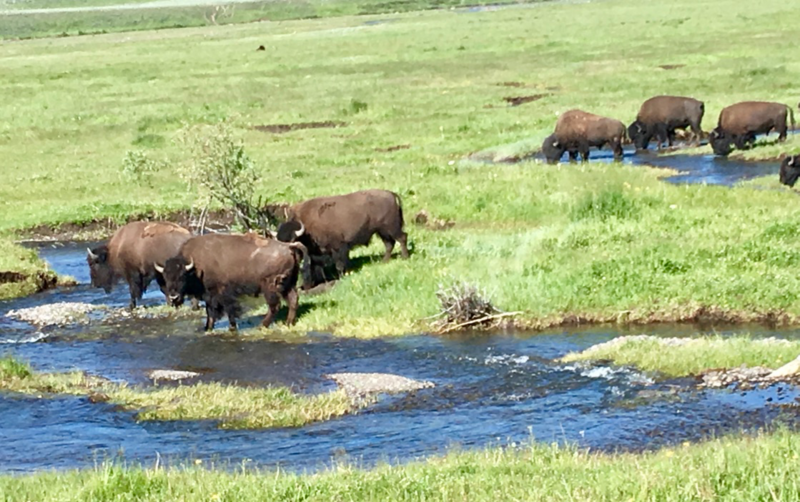 The bison in Yellowstone descend from the last remaining wild bison in the area. 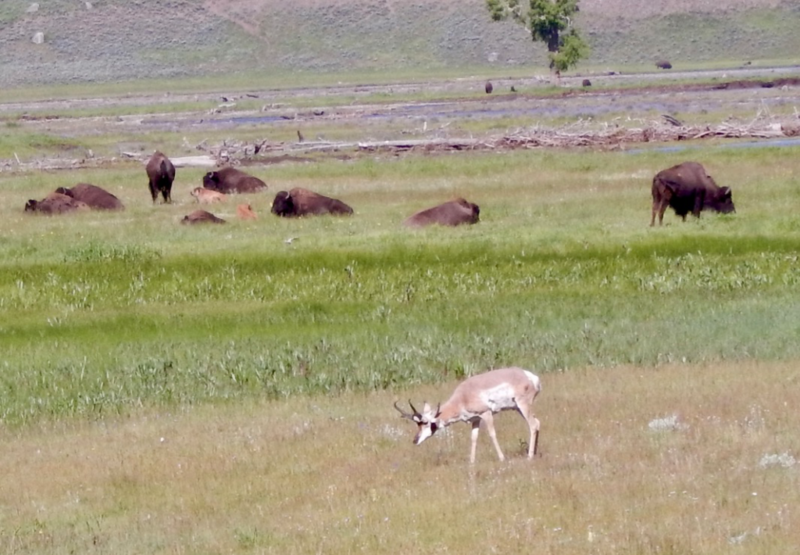 They were almost hunted to extinction, but luckily for us, about two dozen survived under the protection of the US Army in Yellowstone National Park. We would come across several large groups of bison throughout the day. I think we easily saw over 500 bison! Although that number sounds high, it is entirely plausible as there are just under 5,000 bison in Yellowstone National Park. Shortly after heading off again, we saw a herd of pronghorn. Pronghorn are an ancient species indigenous to the area. Pronghorn are neither deer, nor antelope, but rather are their own species. They are unique in that they have branched horns (not antlers), and shed their horns, like mammals with antlers do. A pronghorn amidst the bison. We continued our drive and soon spotted a mama grizzly bear with two cubs walking along a ridge! Unfortunately, there wasn’t a safe place to stop to watch them for longer. Luckily, we all managed to see them from the bus. We also saw deer and elk. I was hoping to see a moose, but it was not to be. I have seen moose in Canada, so I wasn’t too disappointed. Just seeing black bears, grizzly bears, pronghorn and bison, more than made up for it! 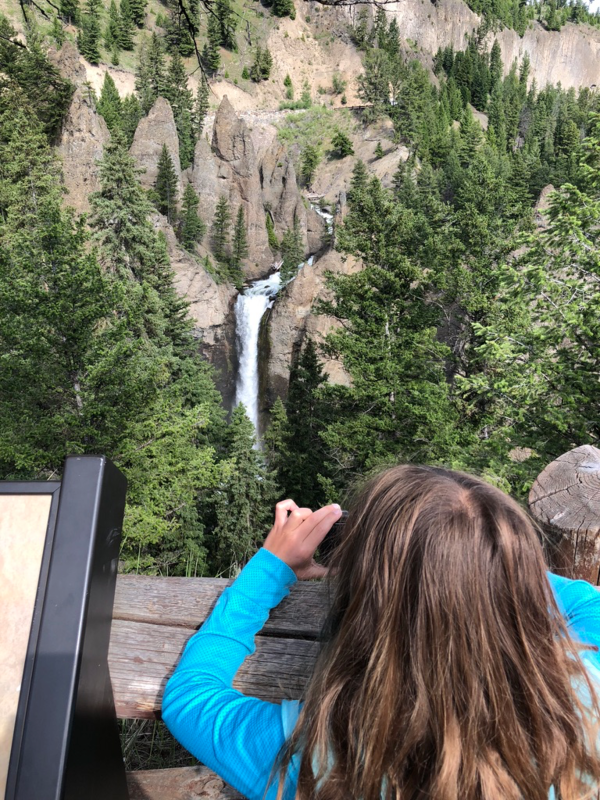 On Day 3 we checked out of Mammoth Hotel & Cabins and made our way toward Grant Village, stopping at waterfalls and the Grand Canyon of Yellowstone along the way. The first waterfall we saw was Tower Fall on Tower Creek. We also stopped to count pika, a small mammal found in the park, as part of a citizen science project. We didn’t see any pika, but we did come across a lot of mosquitos! This was such a contrast from the previous day, where we hadn’t come across any. 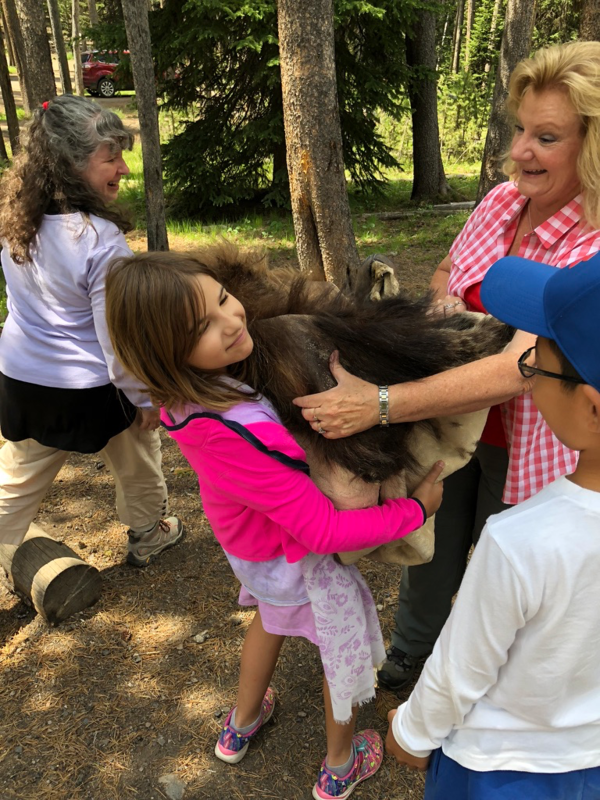 At our picnic lunch stop, our naturalist brought out the coat and skull of a grizzly bear for the kids to touch. After lunch we stopped at the Grand Canyon of Yellowstone. It was an interesting contrast for us because we had just been to the Grand Canyon in April. While the Grand Canyon in Arizona is breathtaking for its sheer scale and its red sand, I liked the variety of colors of the Grand Canyon of Yellowstone. 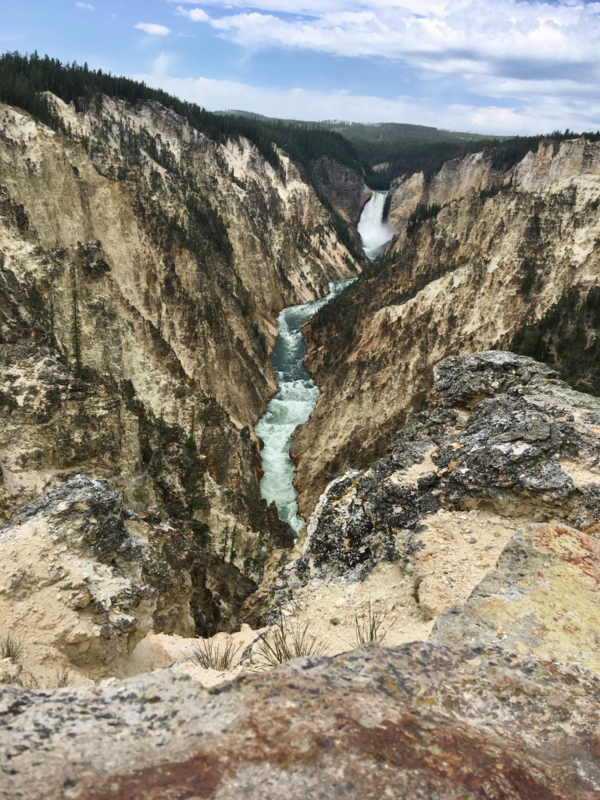 I also like that you can see the Yellowstone River much better in this Canyon than you can the Colorado River in the Grand Canyon. The combination of the trees and a waterfall (the Lower Yellowstone Falls) make this Canyon more visually diverse. Our last waterfall stop was at the Upper Yellowstone Falls . The sheer power and volume (noise-level) of the water rushing over the edge was amazing. We then stopped at the mud volcano and Dragon’s Mouth. The latter is a hot spring that boils out of a deep cave, resulting in a sound that a dragon might make. The most unbelievable thing about this stop was that there were two bison lying in the geothermal area! They had to have walked on the boardwalk to get into this geothermal feature. I don’t know how the bison could stand the heat of the ground. After Dragon’s Mouth we had a brief stop at Yellowstone Lake (stunning!) before checking into our accommodations at Grant Village Lodge. 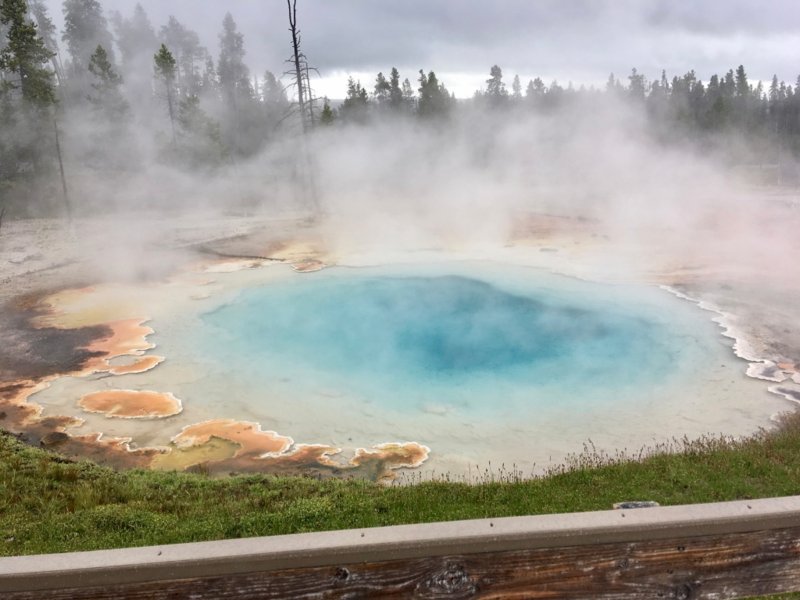 On our fourth day we explored a number of Yellowstone National Park’s thermal features. The kids got to use an infrared temperature gun to measure the temperature of various hot springs. It rained on and off, but for the most part, we were out when it wasn’t raining. I was really looking forward to seeing the colors of the Grand Prismatic hot spring. Unfortunately, due to the weather, most of the colors were not visible. I did see another hot spring that had vibrant blues in it. Blue signifies the hottest part of the spring. We learned about the microscopic life living around the hot springs, and later in the day, we learned how geysers are formed. I love the colors of this hot spring! 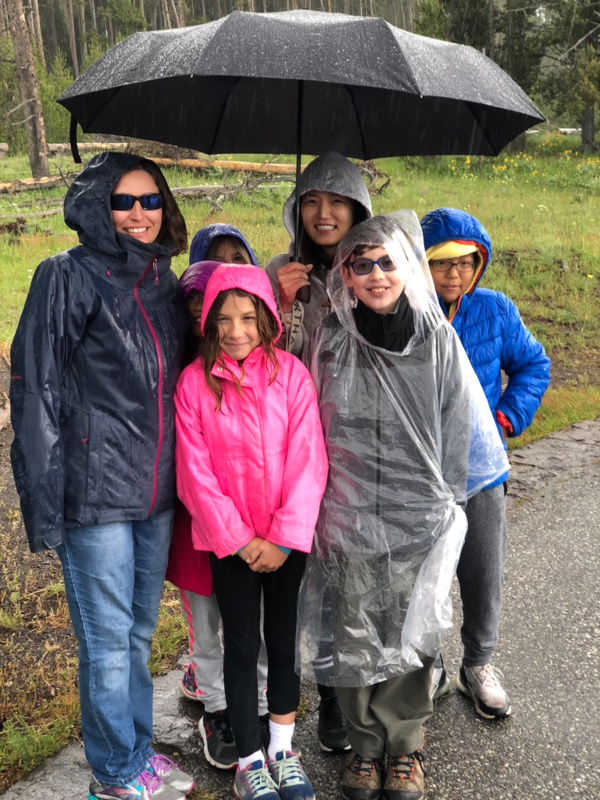 At Old Faithful, we listened to a Ranger talk about the differences between black bears and grizzly bears. Thankfully the talk took place in a yurt, so we were protected from the rain. We also spent some time in the Old Faithful Inn, while waiting for the next geyser eruption. The Inn is a national historic landmark that was built in 1903-1904 out of log and stones. It is quite an impressive building and I highly recommend stopping there. 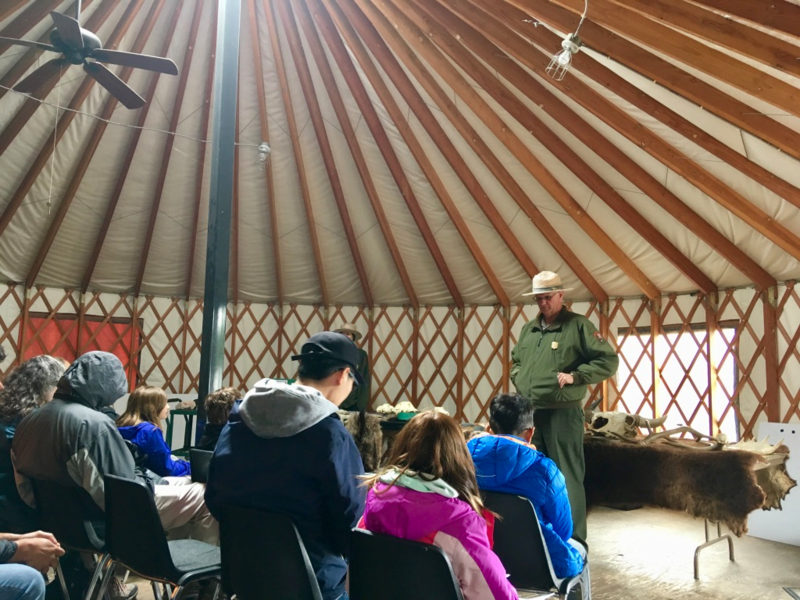 Staying dry listening to the Ranger talk in the yurt. 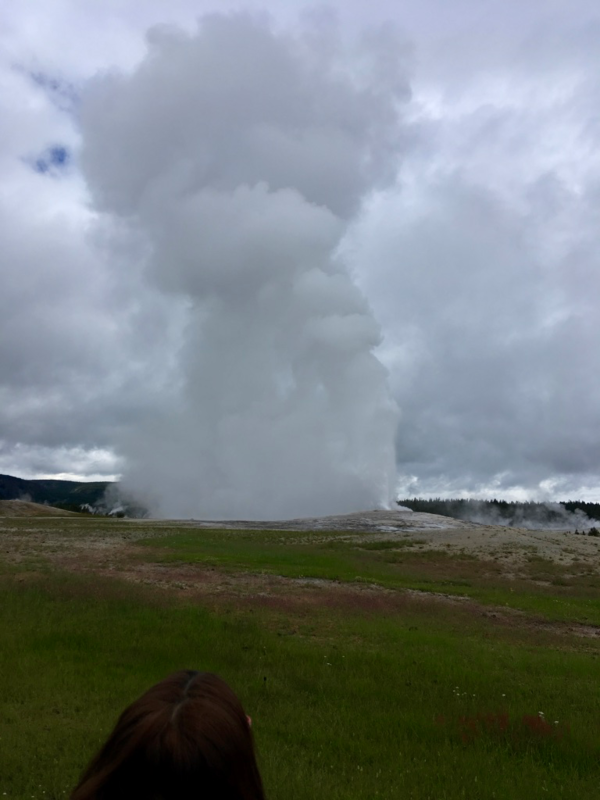 Luckily, by the time Old Faithful was about to erupt, the rain had stopped. Old Faithful is so named due to the regularity with which it erupts. 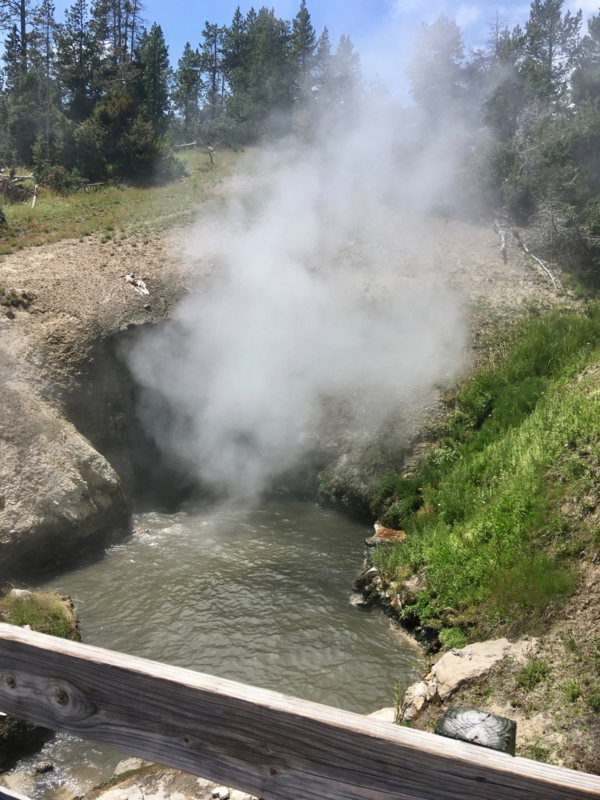 There are two other geysers in the world that erupt regularly (one in California and one in New Zealand) and we had been to both, so we wanted to complete the trio. After we watched Old Faithful erupt, we headed to the Yellowstone Art & Photography Center to do a watercolor painting. The Center had a covered outdoor area with rocking chairs and views of Old Faithful. What a beautiful place to paint! On our last day, we were sworn in as Junior Rangers, and did a little art show of our water color paintings. The kids received a printed picture of one of the photographs they had taken during the week. 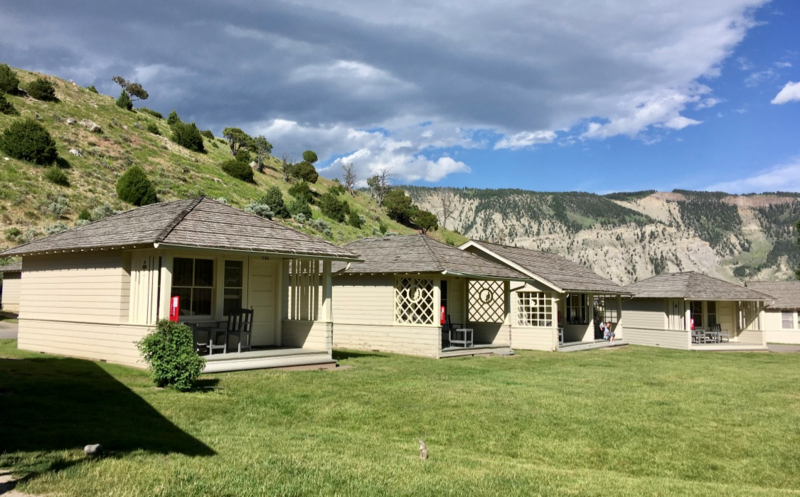 Then we headed back to Mammoth Hotel & Cabins, stopping along the way back to learn about the wildfires of Yellowstone, the flowers, and about the National Park system. We also hiked up to a spot with a view of West Thumb. What was amazing to us was that we mostly had the trail to ourselves. We passed an elk on our hike, but she kept to herself. One family in our group had been charged by an elk at Grant Village. Apparently, she had a young one in the area. Luckily, the family was not hurt. We were sworn in by Ranger Hannah! That evening, the three families had dinner together. It was such a great end to a wonderful week. The kids got along really well, as did the adults. This tour included breakfast and lunch. I would recommend the buffet breakfast because the service at both hotel restaurants was very slow. Lunch is a box lunch that includes a sandwich, apple, chips, cookies, and a granola bar. If you want something to drink besides water with lunch, you’ll have to buy it. By our last day, I was really getting tired of the monotony of the box lunches. A bit more variety in the fruits and snacks would have helped. The good thing is that Yellowstone Forever donates any food you don’t eat to those in need. In terms of weather, we were there at the end of June and mornings and evenings were still cool, so I recommend bringing layers, as the best time to view wildlife is at dawn and dusk. Also bring a rain coat and insect repellant. It can get windy, so if you wear a hat, hold onto it, as we saw a number of hats in one of the hot springs. As with many accommodations in the most popular US National Parks, this tour sells out about 6 months in advance, so book early. 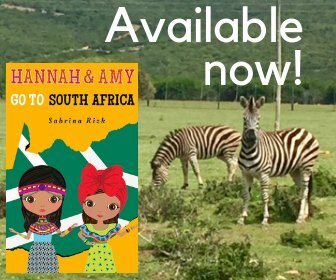 I highly recommend the tour if you do have children in the 8-12 range, as it was great for our girls to have kids of similar ages to play with. This was such a difference from our Southwest USA tour, where there were no children. In terms of affordability, it is a bit on the high side, but I recommend the tour nonetheless. Yellowstone really is a spectacular and very special place. It is one of the best National Parks for wildlife viewing and for its variety of landscapes. That was a good account of your week and loved seeing the pictures.